2014_POY_Becherer_029-copy: Global News Events: Global News Portfolio: New Orleans based Photojournalist covering the Deep South and beyond. GAZA CITY, GAZA STRIP. A family mourns as the body of Muhammed Abu Shagfa, 7, is taken for burial after a rocket attack on Eid al-Fitr, the holiday marking the Muslim holy month of Ramadan, that killed at least 10 people and wounded 46 in the al Shati refugee camp on Monday, July 28, 2014. According to the United Nations 7 in 10 Palestinians killed in the Gaza war were civilians. Many of those civilians were killed when Hamas rockets fell short of Israel, landing in dense Gaza neighborhoods. 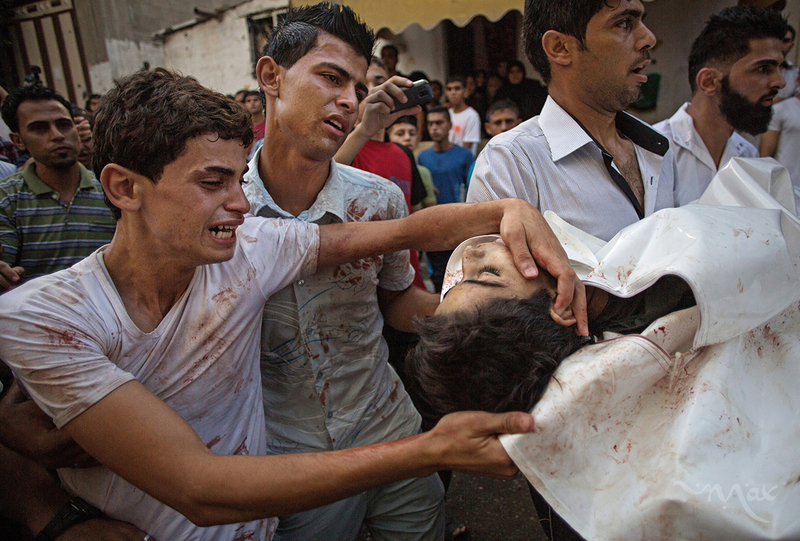 Others were killed when Israeli fire hit U.N. schools and Palestinian homes.